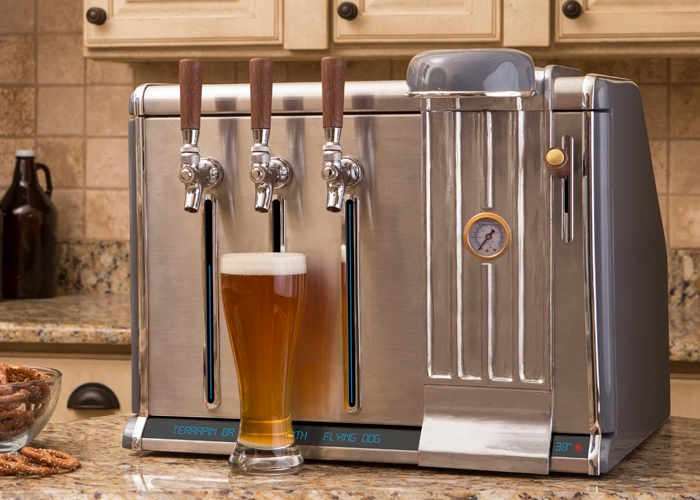 Beer drinkers that enjoy a Growler or two at home may be interested in a new countertop chilling system which has been designed by Randy Hollister, which is capable of chilling and keeping fresh three Growlers at a time. Once installed the growlers and beer inside are available on tap at any time and the system has been designed to preserve freshness, purges oxygen and keeps the craft beer deliciously cold ready to be poured. We believe craft beer lovers everywhere deserve to drink happy beer. Our mission is to ensure craft beer enthusiasts can get the most out of their own personal discovery and exploration of fresh, flavorful brews that taste just as the brewer intended. At the core of our vision is a commitment to supporting the craftsmanship of local breweries and the drink local movement by helping them sell more beer. Growler Chill is a household countertap that keeps 3 growlers cold, fresh, and on tap right at home. – COLD – Growler Chill is a refrigerated unit. You can adjust the inside temperate from 38° F – 54° F. The unit plugs into a standard 120 Volt outlet and due to the well insulated and compact chill chamber design, Growler Chill is highly energy efficient. – DARK – When light strikes beer, the beer can become skunked – affecting both flavor and aroma. Growler Chill’s enclosed refrigeration unit is completely dark, protecting your beer from light at all times. – FREE FROM OXYGEN – Our patented Virginator purges the oxygen in the headspace of your growler with CO2 before you insert the growler inside the device. This prevents oxygen from creating off flavors in your beer before you have a chance to enjoy it. – CARBONATION – Growler Chill uses an internal 90 gram beverage grade CO2 cartridge to preserve and serve your growlers. The device also has an alternate port on the back for those who wish to use their own external CO2 source. This preserves the freshness of each pour for weeks after opening.